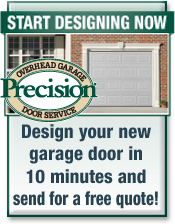 Are you looking for a Steel or Wood Garage Door? Raised or Recessed Panel? Or maybe even Carriage House? Finding the perfect style garage door for your needs is easy... just follow these 3 simple steps and you'll find exactly what you've been looking for! 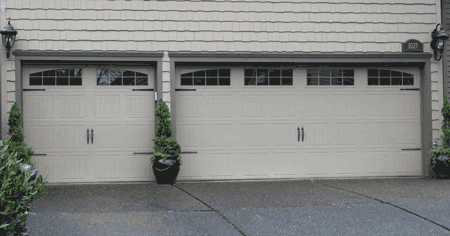 Steel is far and away the most popular garage door because it is durable, maintenance free and you can paint it to match your home's exterior decor. It also has the advantage of being the lowest cost material for a garage door. The beauty of natural wood is undeniable. 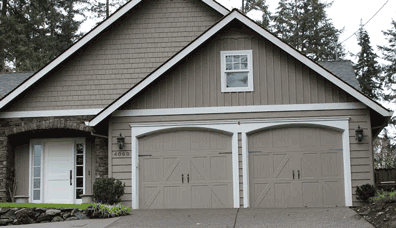 Wood garage doors come in a multitude of styles and have there own subset of materials. 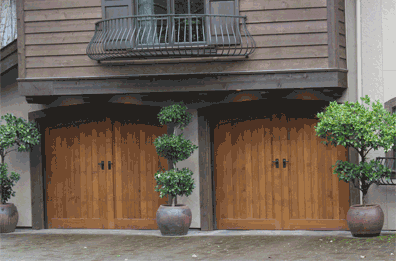 The most common woods used for custom garage doors are hemlock, cedar & mahogany. We have included pictures of each of these in our garage door gallery. These doors are more expensive and require a little more maintenance but people buy them because they get to enjoy the beauty of them every single day. These doors are so gorgeous in fact, that real estate studies have shown they can actually increase the value of your home. Wood-Composite garage doors are ideal for those who want a moderately priced garage door that can be painted to match the home's exterior. They come primed and ready to paint... so they must be painted. Wood-composite doors are made largely from recycled material, so may be considered more eco-friendly. Wood-composite are resistant to warping, peeling and splitting. They are typically a little more expensive than steel. Fiberglass and full view (aluminum glass) garage doors are gaining in popularity because they resist dents and won't rust. As you look, just remember, the style of garage door you choose is largely a matter of personal preference. You're the one who will look at it each day (and if it makes the neighbors a little jealous, well, that just can't be helped). Raised panel is the most popular style for a new garage door today. Most commonly these are shown in short and long panels. There are a great many window design & glass options for this style. 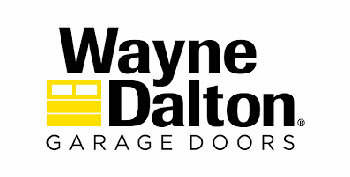 Please see them on our garage door designer. This is the one we remember growing up that EVERYONE had. Well, retro is back, and manufacturers are beginning to revive the design in new and exciting styles. Carriage house garage doors will change the entire look of your home and make your house the talk of the neighborhood. Spend some time on our gallery page to find the style that's right for you. Carriage house doors are available in nearly every type of material available on a traditional garage door now, so you're sure to find one that matches your needs. In addition to the above styles, you may also consider doors that are unique and offer options to match your home's design. These doors can reflect styles from the old world with gorgeous woods such as mahogany, hemlock and cedar; to contemporary and modern styles in materials such as copper, aluminum or glass. Precision can work with homeowners, architects and designers to help make your vision a reality. 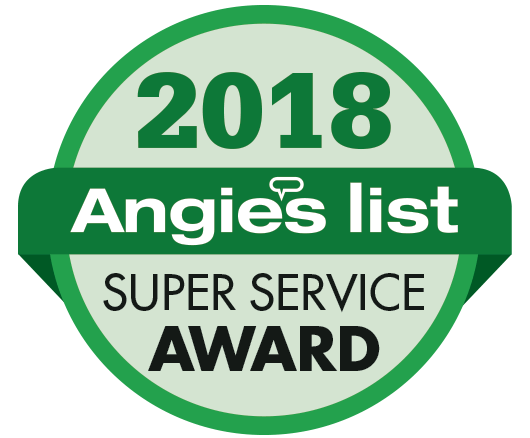 You want to find a garage door company that holds contractor's licenses in Oregon or Washington, and has a track record of providing the best in customer service and products and backs it up with outstanding warranties. 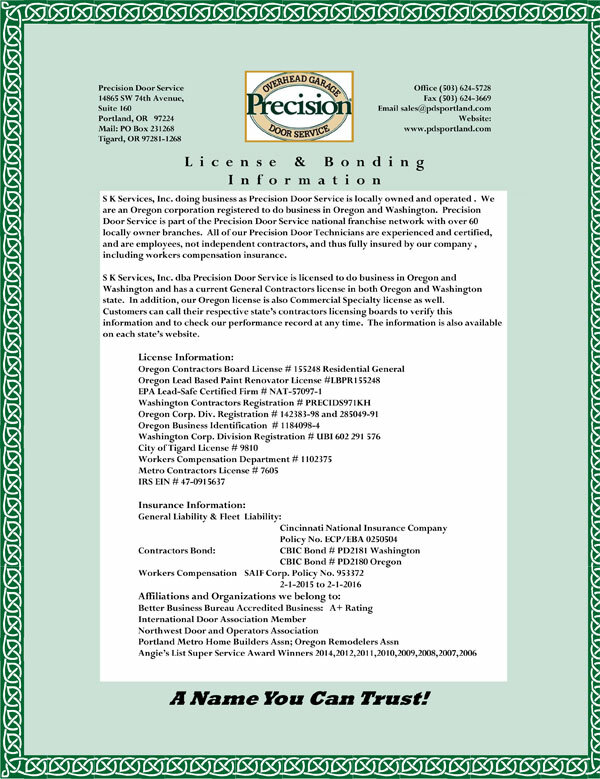 Precision Door Service is a local family-owned business, and does have General Contractors' licenses in Oregon and Washington. This means we are bonded and insured and carry workers compensation insurance on our employees. You can go to your State's Contractors board (easy on-line) to check the license and see our record. The owners, Stan & Kim Prosser, have lived in the metro area for over 40 years and are active volunteers in our community. 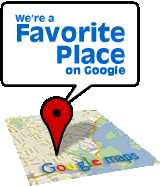 In this area, there is little difference between friends, neighbors and customers to us. 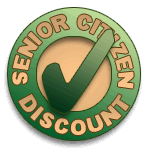 We also stand behind our work with the best warranties in the industry. At Precision, we want your business and are willing to work hard to earn it. When you choose us you can be sure that we are prepared to do an excellent job. Give us a call! Click on the logos below for links to these manufacturers.